Amazon’s virtual “style assistant” is now available to customers in the United States. Dubbed the Echo Look, the $200 camera had been available on an invite-only basis. The Amazon Echo Look is a unique camera designed for fashion focused individuals. Upon setting up the camera, you can use voice commands to take either a photo or 6-second video clip of your current outfit. These are stored and organized by Amazon for future reference. While keeping a catalog of your wardrobe may come in handy, the heart and soul of the Echo Look is it’s style-check service. Using a mixture of it’s machine-learning algorithm and their own fashion experts, you’ll be able to compare outfits and be given a score to see which one looks best. This score will also include reasons such as it making your body look better or the colors are a better match. It’s the AI version of “does this outfit make me look fat?”. This is also not your standard hands-free camera. The Echo Look features depth-sensing, LED lighting, and background blur to make you and your outfit stand out from the room. Multiple users can use the same cameras as well. Unfortunately it does not double as a security camera. For that, you’ll need to stick to their indoor Amazon Cloud Cam. Besides acting as your personal stylist, Amazon has an ulterior motive at play here. The Echo Look app will recommend clothes on Amazon.com to match your style. If you have a favorite shirt for instance, you can request it to find a cute skirt to go along with it. The $200 Echo Look Camera will also connect to the cloud-based virtual assistant Alexa. You can control smart home devices in your home, ask questions, or use the thousands of Alexa skills available. It unfortunately only sports a 1.6 watt speaker which is weaker than even the Echo Dot speaker. This means for music or other room-filling sound needs, you’re better off sticking with the Echo, Echo Plus, or Echo Show. 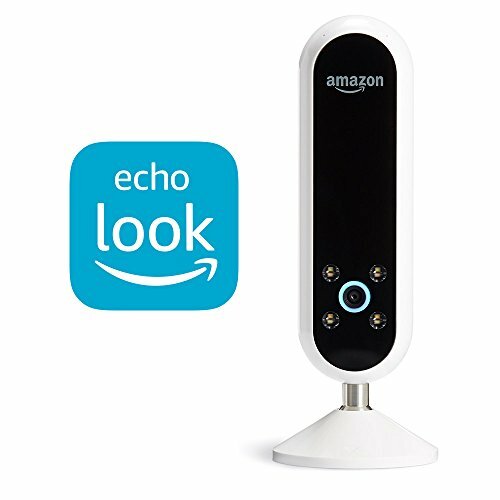 WiseDweller will have a review of the Amazon Echo Look style assistant in the coming weeks.